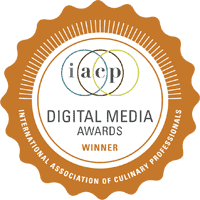 If you’re following me on Twitter, Instagram, or Facebook, you know that I was in New York last week attending the International Association of Culinary Professionals’ Annual Conference. It was an amazing culinary, educational, and inspirational experience, which I still need to decant to assimilate. I will read the many pages of notes I jotted down over the weekend, and I promise to concoct a write-up that should honor the incredible experience it was. In the meantime, I have to tell you about the Chocolate and Pastry Tour I chose as an optional activity on the day I arrived in New York. 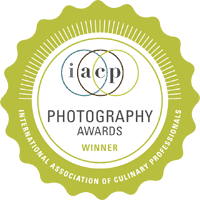 The IACP program provided over 20 different optional tours, all of which looked fantastic. 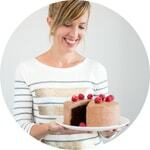 But I was immediately drawn to the Chocolate and Pastry Tour when I saw that pastry chef and author of Les Petits Macarons, Kathryn Gordon, would be conducting it. 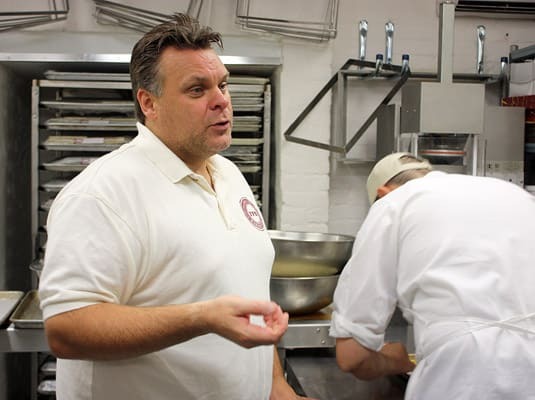 Chef Gordon is amazingly experienced, having trained under renowned pastry chefs and worked in some of the city’s most famous kitchens like Le Bernardin and Le Cirque. 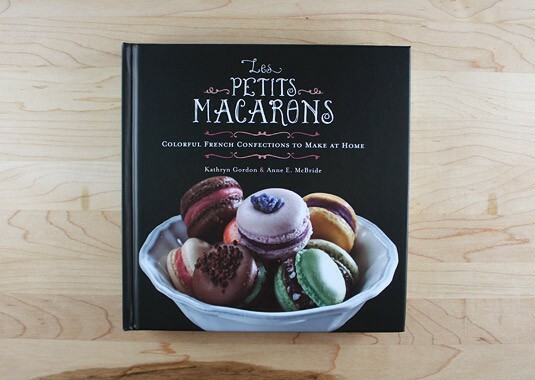 Being the macaron lover I am, I bought her book as soon as it came out in the fall of last year. 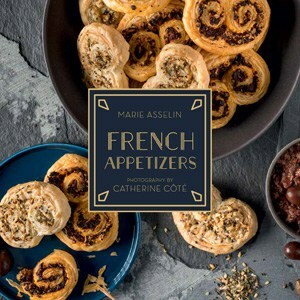 It’s a beautiful full-color reference filled with great tips and advice, a unique troubleshooting section, and lots of recipes, including savory ones, which I especially like—maple-bacon-bourbon macarons, anyone? 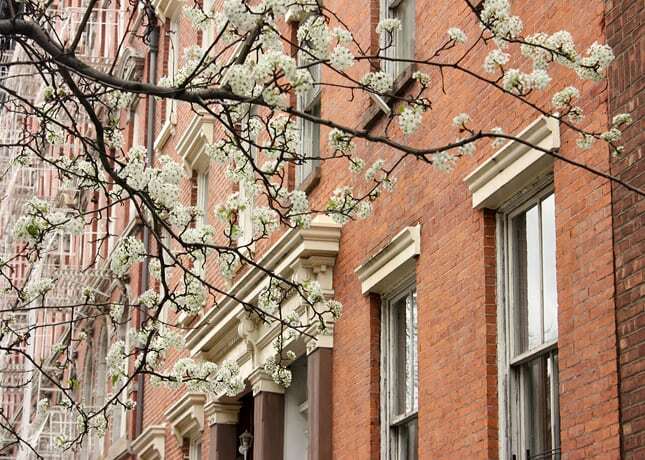 Of course, it was impossible to cover the whole of Manhattan in three hours, so the tour concentrated in the Hudson Square, Soho, and Lower East Side neighborhoods, which do seem to be home to the best pastry shops in the city. 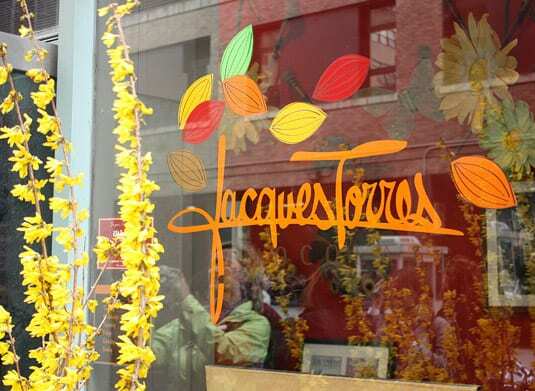 We took the subway down to Hudson Street and started our walking tour at the shop of the city’s most famous pastry chef, Jacques Torres. 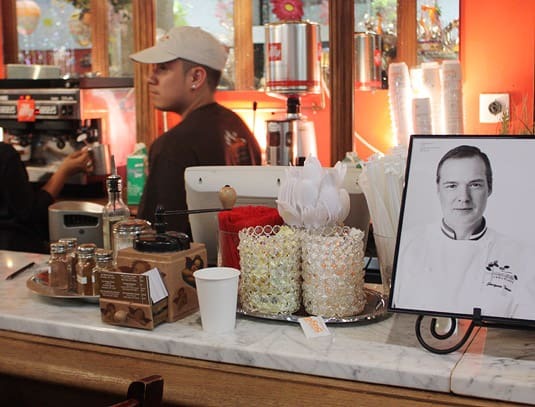 Chef Jacques Torres, MOF, needs no introduction—he is, after all, nicknamed “Mr. Chocolate.” (If you’re not familiar with him, read his bio here.) 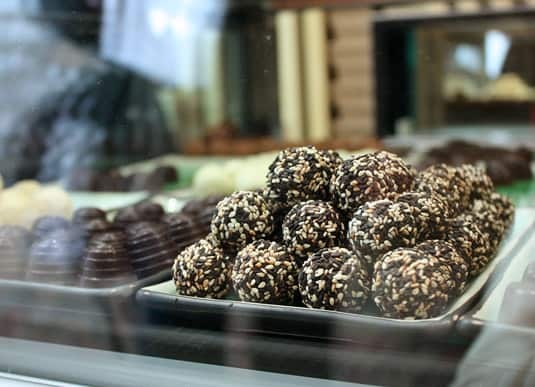 Although he has six other shops scattered throughout the city, his Hudson Street shop is a mandatory stop for all chocolate lovers visiting New York. 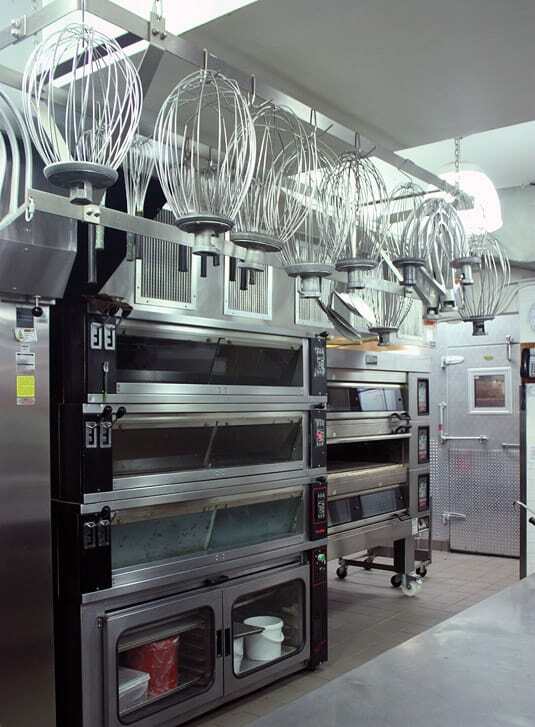 It’s a large space that offers the chef’s full range of products, from cookies to premium filled chocolates. There is also a coffee bar with tables for those who wish to linger in the master’s temple of sweets. 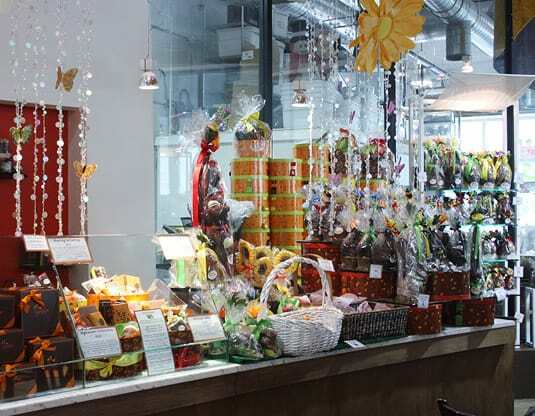 The walls to the back of the store are made of glass, which allows customers to see the store’s workshop and witness the chocolate-making process as though they were watching one of the chef’s TV shows. Although the filled chocolates we tasted were delicious (I particularly liked the “Heart of Passion”—a milk chocolate heart with fresh passion fruit and Alize liqueur.) I was, though, surprised to find the store so cluttered. Yes, it was Easter season, so the store was filled to the brim with hundreds of gift baskets and chocolate animals, but the décor of the store itself felt a little bit dated with its big, fake brightly colored flowers, glass pendants, and glittery butterflies. It wasn’t a place where I would enjoy lingering for too long. But then again, you come for the chocolate, not the décor. 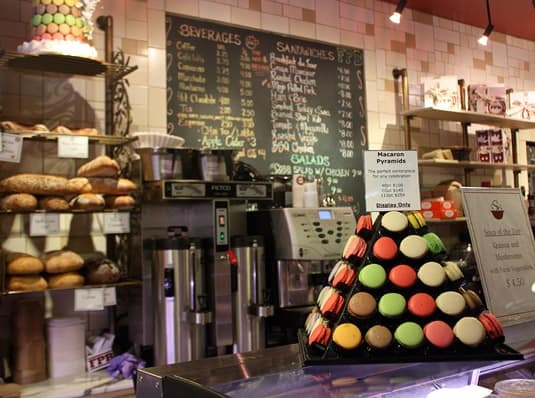 The West Houston Street store is a laid-back French-style café where pastries, macarons and full meals (such as baguettes and salads) are served. I loved the beautifully made traditional pastries, such as miniature Apple Tart Tatin and Basque cake wedges. Payard’s macarons are also delicious and consistent. 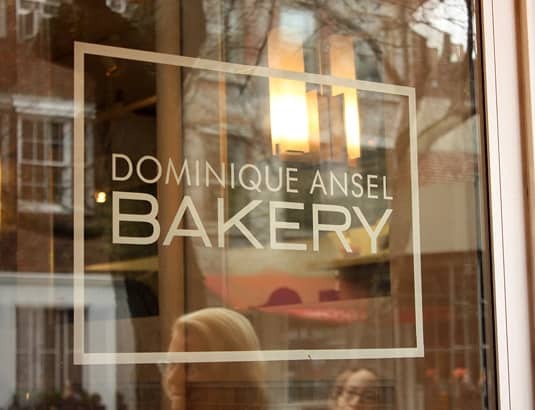 A jewel of a pastry shop right in the heart of Soho, Dominique Ansel Bakery was my favorite stop of the whole tour. 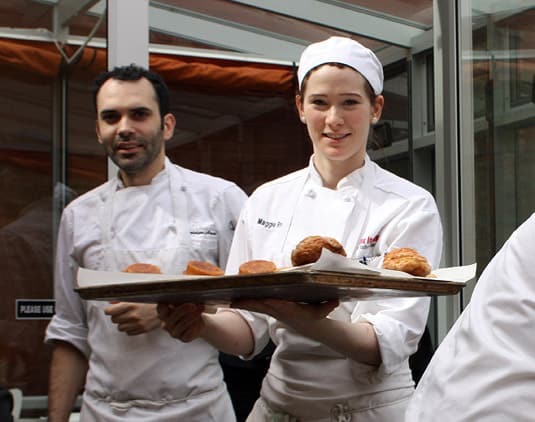 Chef Dominique Ansel, part of a younger generation of chefs, has already won many awards and worked in highly regarded kitchens such as Jean-Georges in New York. 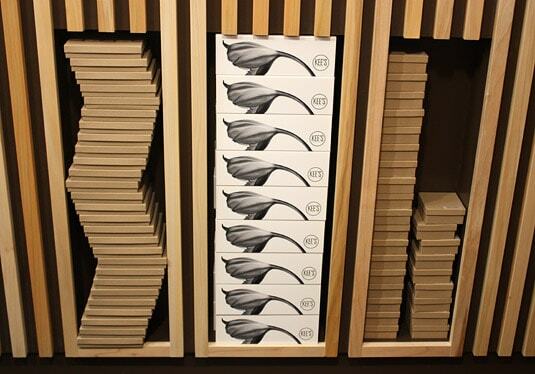 His eponymous store, minimalist and sleek, opened in 2011. His pastries are simply spectacular, and he is the only chef in New York making Brittany’s specialty pastry, Kouign Amann, which I thought was simply heavenly. I also tasted the Salted Caramel Éclair, which offered a shockingly delicious sweet and salty hit. Delicious treats coming our way. Chef Ansel is in the back. 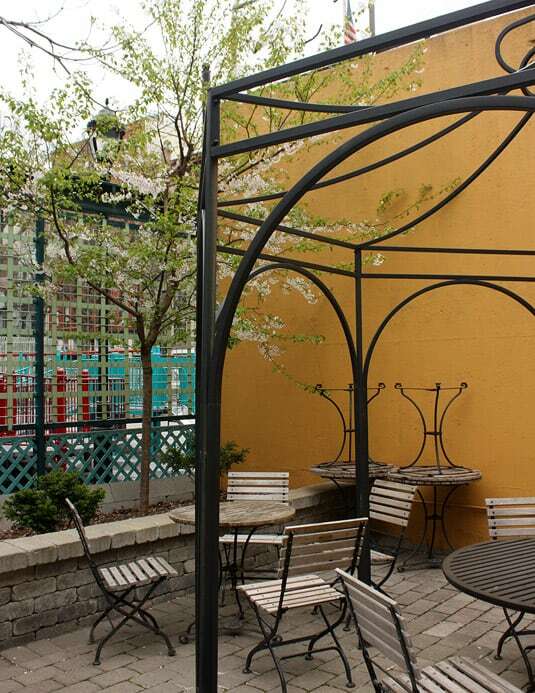 If Ansel’s pastries are not enough to convince you to visit Ansel’s store, then his store’s beautiful seating area should do the trick: half of it is sheltered in a greenhouse, and the other half is outside, in a beautiful (and unique for New York!) inner courtyard bordered by a narrow plant bed and a romantic cherry tree. I suspect it must be hard to find a spot in this little corner of paradise in the heart of summer! 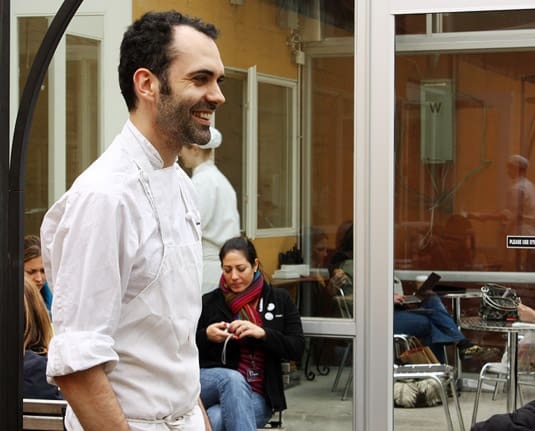 I was completely charmed by the chef, who came out of his kitchen to tell us a little about himself and his work, and by the shop, which I intend on visiting again during each of my future trips to New York. 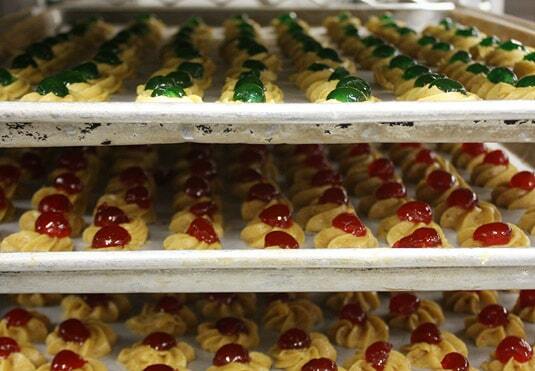 Recognized as one of New York’s finest chocolatiers, Chef Kee Ling Tong may also be the most creative. 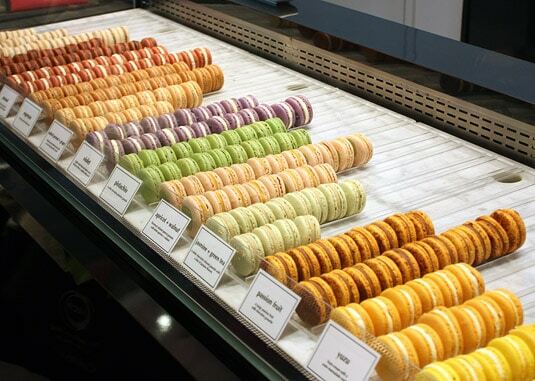 The small, modern Soho boutique sells macarons, but you are really here for the chocolates, which range from classics such as pistachio and salted caramel to innovative flavors such as lemon basil and kaffir lime. I found the black sesame chocolate to be simply spectacular. 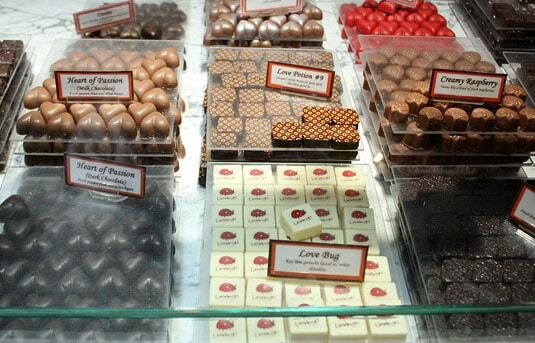 Kee’s is an absolute must for those who love to try things outside of the (chocolate) box. Our group litterally took over the small shop! 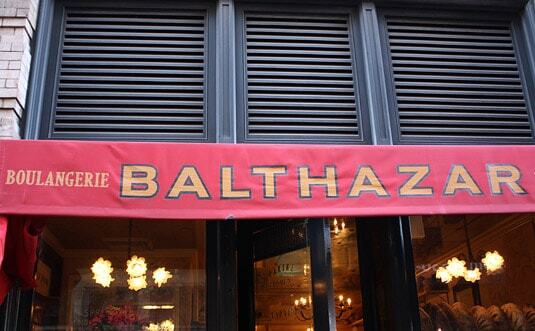 The very small Balthazar Bakery will seduce anyone who’s ever visited Paris; its French signs and classic décor makes you feel like you’re entering a (miniature) film set. 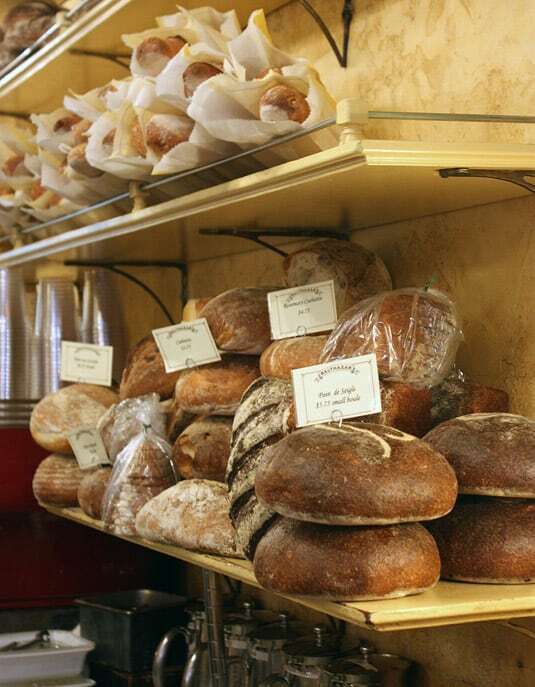 Perfect breads and classic cakes await. For a bigger dose of French cuisine, there is also a gorgeous restaurant right next door where classic dishes are served, such as oysters, escargots, and steak-frites. The last visit of the tour, but not the least: this Lower East Side shop sells nothing but macarons. 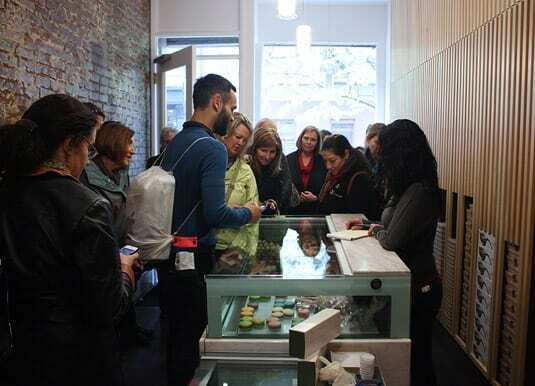 Opened in 2010, it still thrives, and I hope it will survive the macaron fad, because the shop really excels at the art of making perfect macarons. 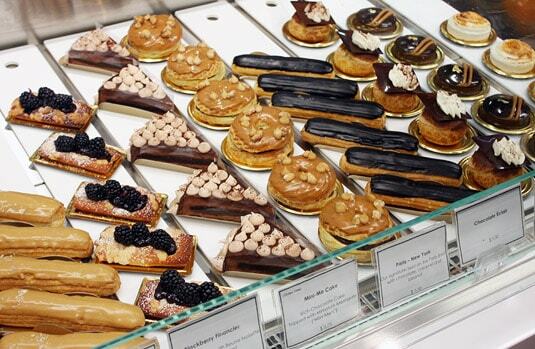 Its creations are the best I’ve tasted since my last visit to Pierre Hermé’s store in Paris. The shells offer the perfect crunchy-tender contrast, and their fillings are bursting with flavor. An unsuspecting customer could dismiss the vanilla variety, fearing it would be too bland compared to the other flavors, but make no mistake—even this unassuming macaron offers an intense hit thanks to the fresh Tahiti and Madagascar vanilla added to the butter cream. All the flavors I tasted were lovely, but I fell head over heels for the Yuzu macaron, a recent addition to the Bisous, Ciao lineup—the cream offers a delicate yuzu aroma, but an almost liquid marmalade center has the power to convince any skeptic that yuzu is the best citrus in the world. 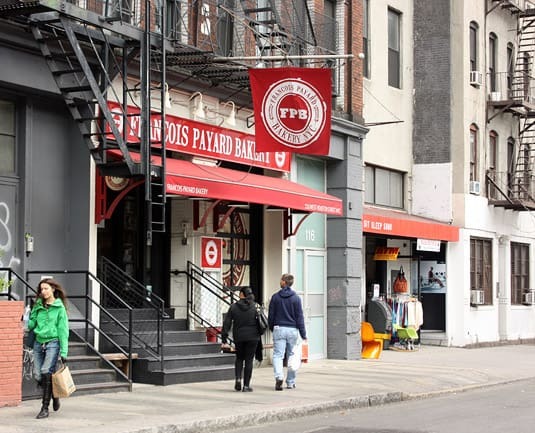 OK, maybe I just got carried away here, but seriously, I would trek all the way to the Lower East Side just to enjoy another one. 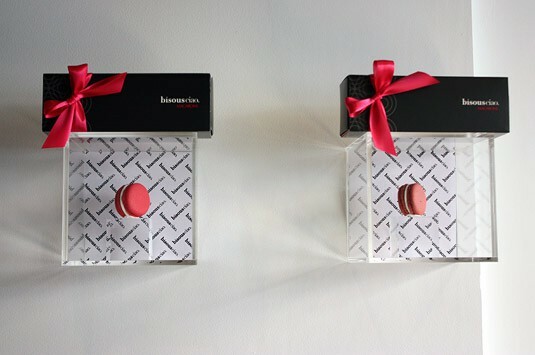 For serious macaron fans, the store has a Macaron Club Mailing List, and they deliver all over New York City. I can’t end this post without saying how fortunate I feel that Chef Kathryn Gordon was our private guide on this delicious tour. 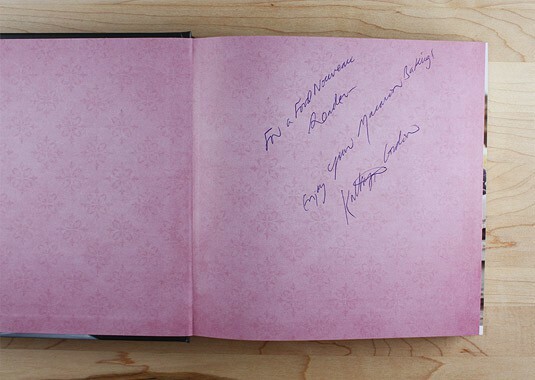 Generous in her explanations and rich in experiences to tell, she was endlessly enjoyable to be around. I only hope I didn’t bore her with all my questions! Subscribe to Food Nouveau’s monthly newsletter and get an additional entry. When subscribing, make sure you enter your name and email address (which will remain private) to make sure I can reach you if you win. PLEASE REMEMBER: Leave a separate comment for EACH of your entries or only one entry will be counted. If you already follow me on Twitter, Facebook and/or already subscribe to the Food Nouveau monthly newsletter let me know as well, since this counts as an entry. Pierre Hermes store in Paris is my favourite. There really is nobody like him! 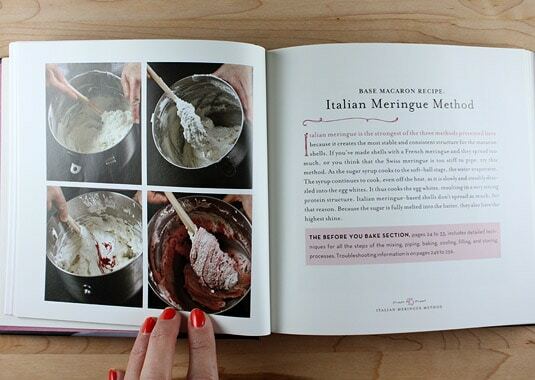 Often I crave his Macarons and in making them myself, often refer to your fantastic site for tips and troubleshooting. 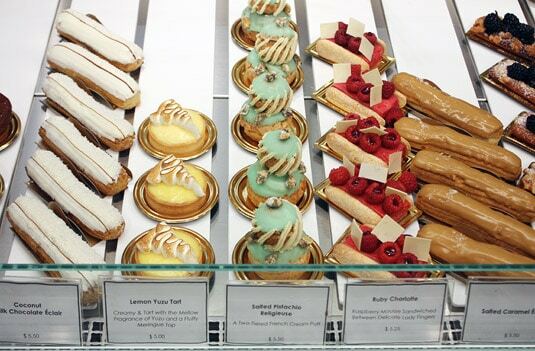 My favorite (also because it's close to my hometown) is the pastry shop within Bottega Louie in Los Angeles. 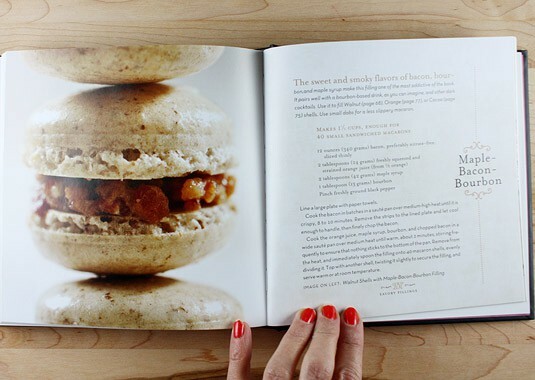 I believe their macarons best represent those of Pierre Herme's! Very delicious and gorgeous! 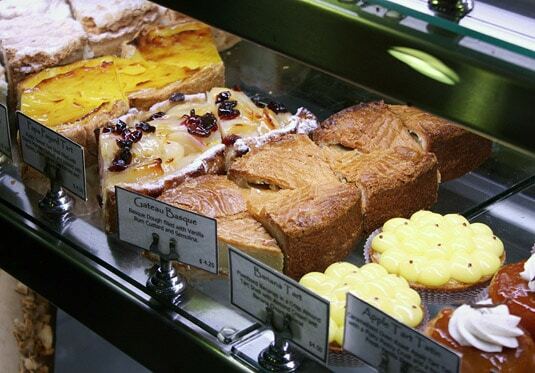 My favorite pastry shop… I like the Carmel Valley Coffee Roasting Company. They have AMAZING biscotti! I will definitley save all of the places you mentioned for my dream New York trip list of places to go. I forgot to mention that my favorite shop for Italian pastries is Mike's pastry in Boston North End..! Marie – such a great post! lovely photos as always. I live in NYC and have not been to all of these pastry shops but I'll definitely put these amazing places on my list of things to do! My favorite pastries are macarons, simply for their pure loveliness and gorgeous colors. Second to that would be an authentic Italian cannoli with chocolate chips..mmmm! great seeing you at the IACP conference! Moonstruck Chocolate in Portland, Oregon is my favorite! I just made my first successful batch of macarons this past weekend as an Easter Surprise for my family. Your tips and hints helped me make them a success. I just added you to follow on twitter. Just "liked" you on Facebook. Laduree Paris is my favorite pastry shop. 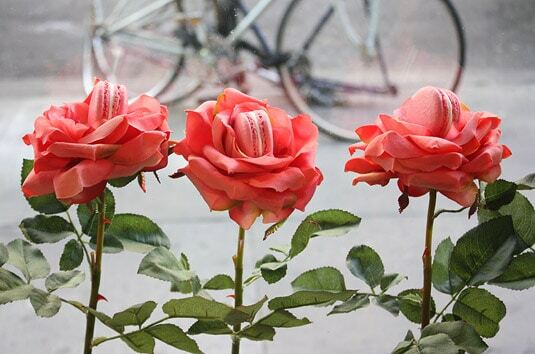 When I was in Paris traveling, I tried many different macarons, desserts, and coffee shops. Most of the delicate desserts were too sweet but Laduree does their confectionaries the perfect degree of sweetness. Their tea room atmosphere is perfect and their menu is wide range of unique dishes. Of course, I tried their macarons, chocolates, and rose petal ice cream. Perfect range of desserts. 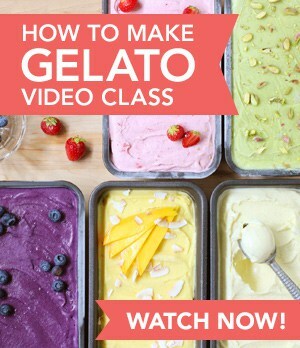 I would love to try all their ice creams again too, it's different; more like a sorbet. No wonder they have been in busy for 150 years! I also followed you on Twitter as well. Rogers Chocolates in Victoria, BC are the most amazing chocolates I've tasted. I'm willing to be convinced of the excellence of others, however! 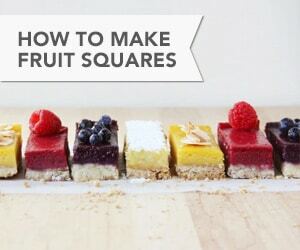 I Subscribe to Food Nouveau’s monthly newsletter ! My favorite pastry shop in St Louis is La Bonne Bouche which is famous for its dramatic Chocolate Mousse Cake. In Champaign, Illinois my favorite is Mirabelle which makes the best Chocolate Brioche. In Switzerland my favorites are too numerous…but I have fond memories of a tea room in Interlaken called The Schuh. One of the best kept secrets, however, is that there is a Belgian Chocolatier living in central Illinois and she will deliver. Her chocolates are divine and they are more reasonalbly priced than those in big cities. I have "liked" you on Facebook and joined your newsletter. Thanks for putting me in the drawing! Don’t forget to leave separate comments for each entry (you should leave 2 more comments – 1 for the Facebook like, and 1 for the newsletter) to increase your chances to win! "Liked" on Facebook (Julie Walker)! 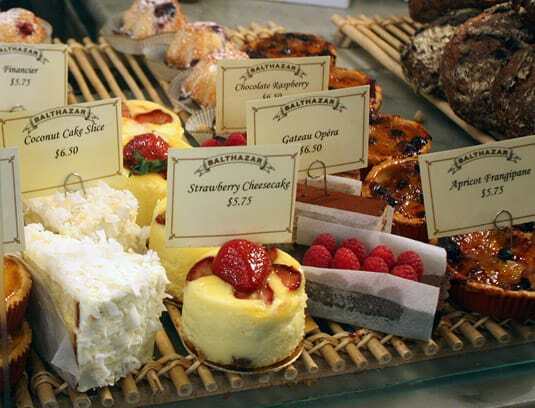 Choosing a favorite chocolate or pastry shop is like choosing a favorite child! My favorite place to buy macarons, at least, is Paris 66 here in Pittsburgh. i also just subscribed to you! My favourite shop is Ottolenghi in Notting Hill, London. Love their flourless chocolate cake, which to me is the best chocolate cake I tasted yet. 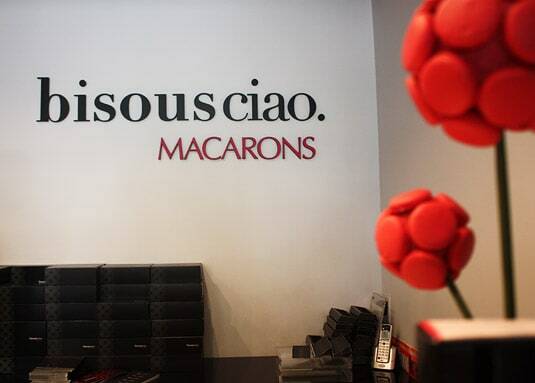 I'm embarrassed to say I haven't yet been to Dominique Ansel or Bisous Ciao yet! Must change that soon. My favorite bakeshop is Sugar Sweet Sunshine on Rivington Street – it's a tiny place that makes the best lemon cupcakes I've ever had, and they did the cupcakes for my wedding. I also just subscribed to your twitter, newsletter, and became a fan on facebook. Do i meed to write separate entries for all of those? Please let me know, thanks! Love your macaron tutorial, btw! Hello Claudia! Yes, please leave one comment per giveaway entry. Thank you and good luck! My favorite place to get my macaron fix is Paulette's (now simply called Lette's) in Beverly Hills. While the brand has been criticized for being too "commercialized" by some, I simply cant get enough of their macarons!! 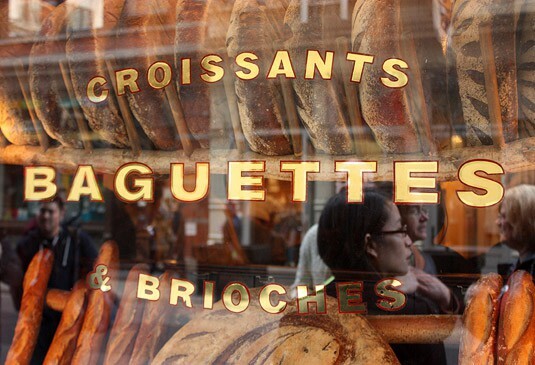 This is a great summary of my favorite pastry shops on the Lower West Side of Manhattan. Bravo. Sadly I don't know the name of my favorite pasty shop but I can tell you it is at the Bussy-Sainte-Georges stop on the Paris RER A line. Several years ago I visited and every morning I stopped and got the most delicious apple turn-overs and then different sweets every evening. Delicious!! 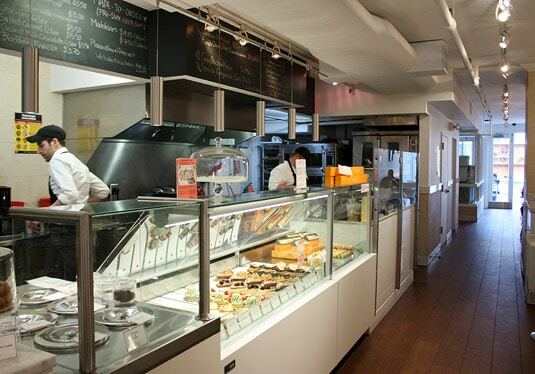 My favorite is Bakeshop in NYC (just opened within Cookshop restaurant) – pastry chef Amanda Cook is amazingly talented! I have to agree with Rochelle. Essence bakery in Tempe is one of the best shops for macarons. My favourite pastry shop is in Henri Charpentier in Japan (the original is in Ashiya, but they have shops all over Japan). I love their financiers, their salted caramel macarons, and their salted caramel cake! 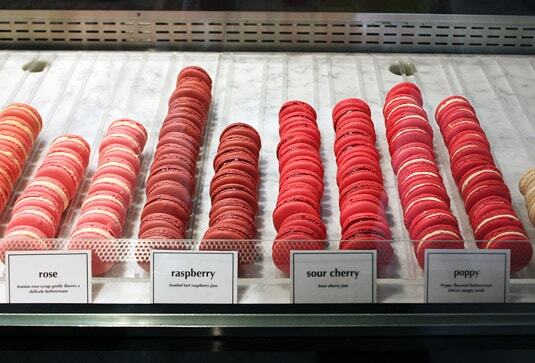 my favorite pastry shop for macarons is Essence Bakery in Tempe, AZ.